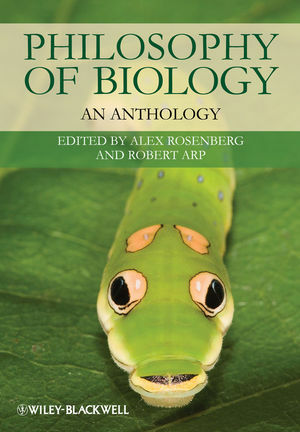 By combining excerpts from key historical writings with editors’ introductions and further reading material, Philosophy of Biology: An Anthology offers a comprehensive, accessible, and up-to-date collection of the field’s most significant works. Alex Rosenberg is the R. Taylor Cole Professor of Philosophy, Professor of Biology and Director of the Center for Philosophy of Biology at Duke University. He has published 11 books on the philosophy of science including The Philosophy of Biology: A Contemporary Introduction (2007) with Daniel McShea. In 1993, he won the Lakatos Prize in the Philosophy of Science and in 2007 was the National Phi Beta Kappa Rommell lecturer in philosophy. Robert Arp is Research Associate with the National Center for Biomedical Ontology at the University of Buffalo and works with the Ontology Research Group at the New York State Center of Excellence in Bioinformatics & Life Sciences in Buffalo, New York. A PhD in Philosophy from Saint Louis University, he has published in the areas of philosophy of biology, philosophy of mind, and biomedical ontology.